At school, Cam has expressed a continued interest in science. His teachers have always noted his curiosity. When he arrived home this week with an Action Kit from DTE Energy, there was a certainty that the contents of the kit would be explored and dissected that very evening. 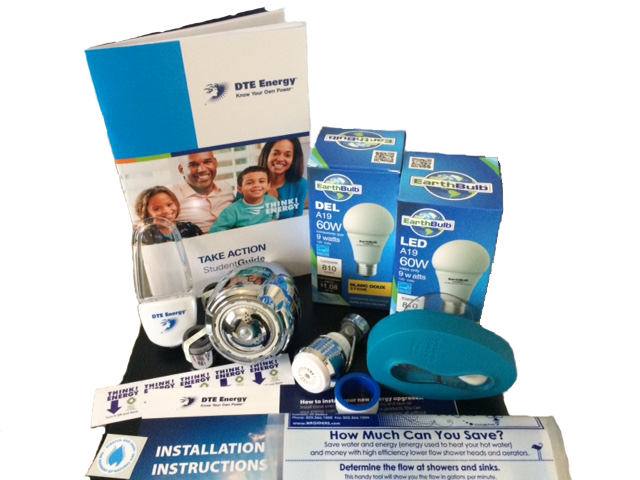 The materials contained within the box included: 2 LED lightbulbs, an energy-saving showerhead, shower timer (Jane probably won't be using that one), LED nightlight, bathroom aerator, kitchen aerator, and a flow test bag. 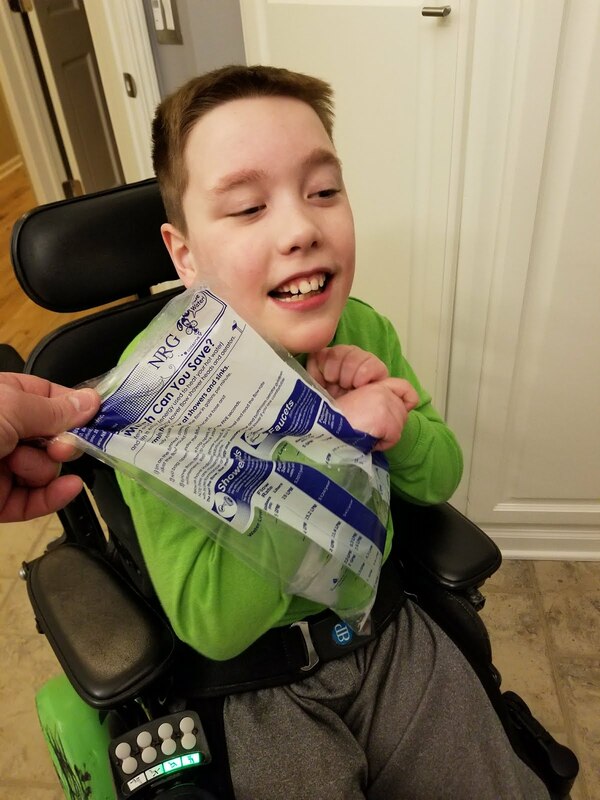 Cam and his dad successfully replaced a showerhead and installed both of the aerators, along with the lightbulbs and nightlight. The test flow bag was used as well to ensure the proper flow of water. Like the Energy program, some projects are spontaneous and unplanned. 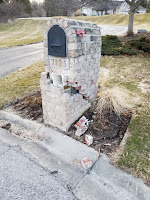 For example, when Cam's morning bus driver accidentally backed into our brick mailbox one morning this week, the boys suddenly had another project on their list. This one, however, would require research and time. 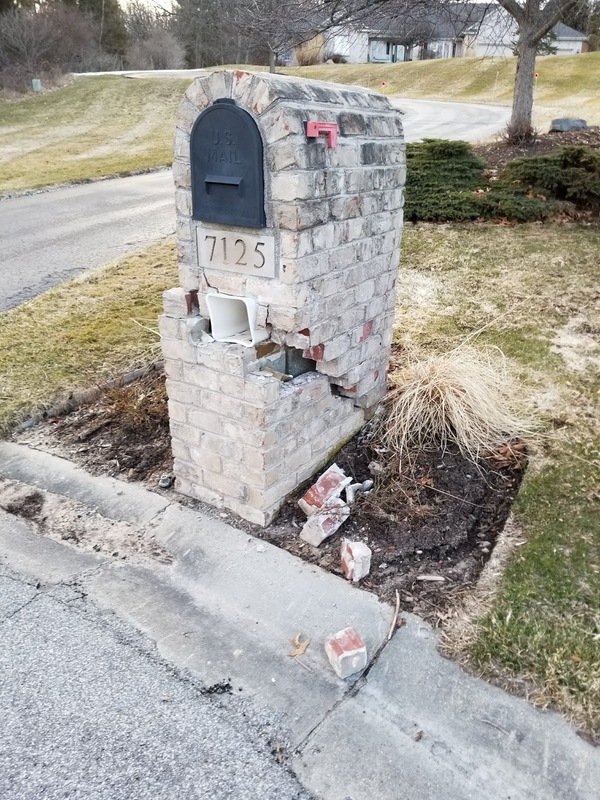 Chris and his son investigated "pushing" the bricks back into place, but after some test pulls, determined this would not be a fix. Additional analysis by the father and son team would go into the following week. 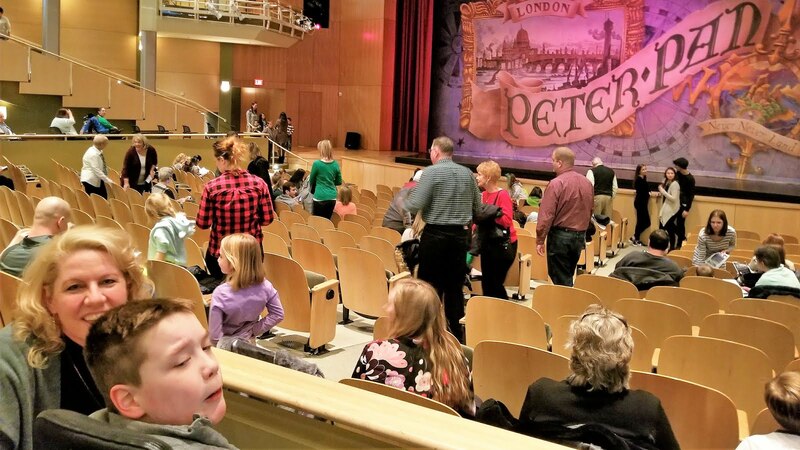 Saturday afternoon, the Weatherford family had tickets to see the Peter Pan musical production performed by the Forest Hills Central High School. We all couldn't wait to see Megan Raisch perform as an Indian and mermaid while sister Sarah was an important part of the backstage crew for the play. The performance was so good and it was thrilling to see characters flying around the stage. During the intermission, we were surprised and happy to see Cam's buddy, Brody, with his family! After the show, Megan and Sarah spotted us and came over to chat. Cam seemed a bit starstruck seeing Meg in her costume. 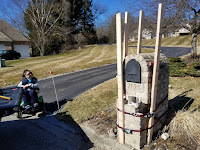 The sunshine continued warming us up on Sunday afternoon when Emma appeared to construct her famous "chalk city" in our driveway. 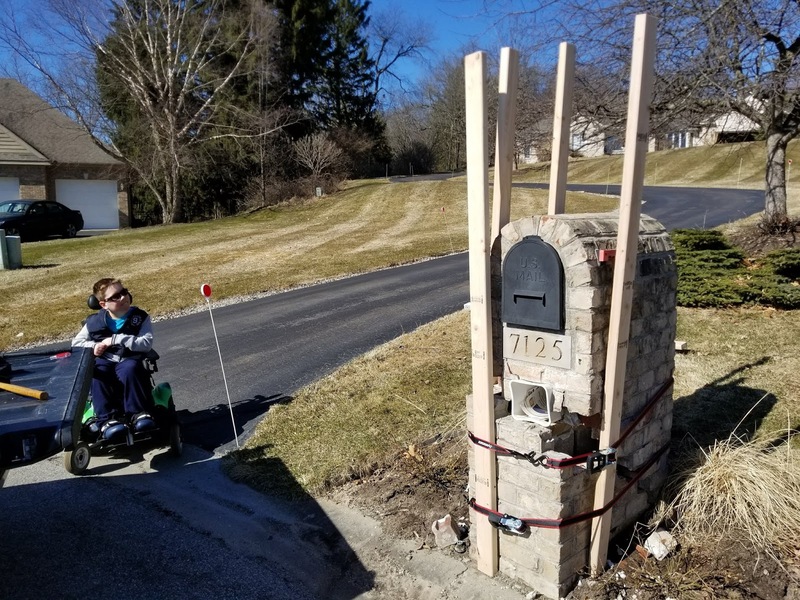 The creation included all kinds of crazy arrows for Cam to maneuver through and around as he enjoyed walking outdoors again. Emma's tireless efforts and inventive pictures remind us that our world is ever-changing and ready to add people and places into our lives at each turn and direction we take. "Mom, why don't the boys wake up at all? Peter is very loud."